Ocean conservationists (and fish) got some rare good news from Washington this week: President Obama created the world’s largest fully protected marine reserve in the central Pacific Ocean. The presidential proclamation – which does not require congressional approval – will expand the Pacific Remote Islands National Marine Monument from almost 87,000 square miles to more than 490,000 square miles, placing the area off-limits to commercial fishing and many other activities that can damage the environment. 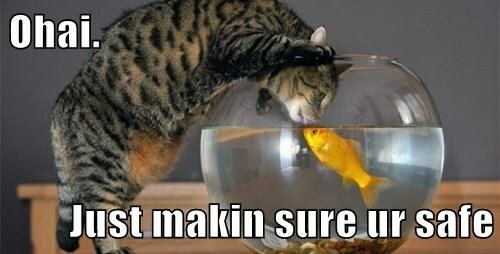 And what’s good news for fish is good news for kitties, right? You can read more about the expansion of the marine reserve in this article from National Geographic with a follow-up about how the new rules for the area will be enforced. This entry was posted in Science Caturday and tagged Obama ocean conservation, ocean reserve, ocean science lolcat, Pacific Marine reserve. Bookmark the permalink. Great news. As a vegetarian I’m against fishing anyway and I’m glad to hear they have somewhere to live and swim without being bothered by people.